In this new episode of the Memberium Customer Spotlight series, Jamal Miller walks us through how he and his wife Natasha had built their membership site, ‘The One University’ with Memberium, LearnDash and Infusionsoft. Since launching, their membership site has helped over 100,000 students prepare themselves for love and marriage. They take a unique approach to creating an authentic, close-knit online community that keeps their members highly engaged. In this video, you’ll get the inside story of how they launched their site and what it took to make their membership site so successful. Along with tons of other useful nuggets for anyone running a membership site. 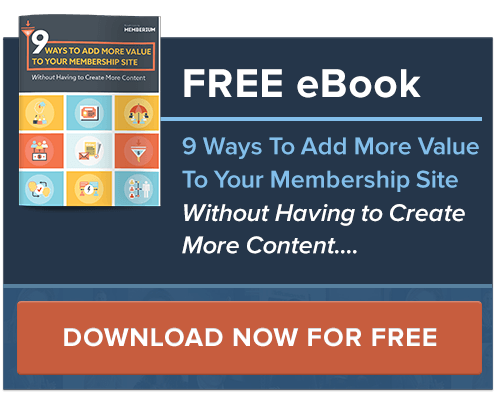 To learn more from Jamal and Natasha on how to launch a successful membership site, you can download this free guide, ‘The 6 Tools We Use to Run Our 6 Figure Online Business’. They’ll break down how they used the same framework for every one of their webinars the past year, how it helped them generate over 50,000 leads and over six figures in revenue the past year. Micah: Hey, everybody. It’s Micah Mitchell with Memberium, and I’m here with Jamal Miller who is the CEO of Miller Media Group. He’s also the founder of marriedandyoung.com. He’s in the relationship niche, which is really cool. It sounds like we’ve got a couple of things in common. But, Jamal, thanks for coming. Thanks for being with us, man. Jamal: Absolutely, Micah, my man. I appreciate you guys, all of you guys have done from the membership site world. It’s so awesome to be able to be pulled in to go deeper into a little bit and create, so I consider it an honor, absolutely. Micah: Well, cool, man. I remember you came and turned off because I was calling maybe like a month ago and you were just so exciting. I was just like, “Yeah, I got to entertain this guy.” Let’s jump right in, but maybe why don’t you give us some history about yourself, first of all. Just an overview of your personal history and your company’s history would be great. About 6 years ago, man I’m about to date myself, I graduated with a degree of theology. So I was fully headed that kind of path of being a full-time pastor and in full-time ministry. During that time, majority of my schedule was still with speaking and traveling the country. Then I moved to Chicago and I became an associate pastor at a church here in Chicago. But being in ministry, we don’t make a lot of money. So this led me into getting a part-time job – working part-time at the church, part-time in a non-profit organization. But what’s cool during that time, I was absolutely single. I ended up meeting my wife, getting married. But we’ve meet in a very unconventional way for the Christian world. We met on Facebook and it was just one of those where people are like, “Oh, my gosh. How did you got here? You were complete strangers.” Because we did meet on Facebook, people did start asking us how it worked, what was the process, what’s the journey. And this led us to recording a video of our entire process, putting it on YouTube, and you all know how that works, and we called it, “A Facebook Love Story”. That video was viral after we got married. People start flooding the YouTube channel, “Hey guys. Are you guys still married? What’s going on?” And that’s when I was like, “Babe, we got to create something to take these people along with us on this journey.” And that’s when we created marriedandyoung.com. I had no idea about the logging. I’ve never heard of it. Do you know what I’m saying? I was like – but I just got this idea and it was cool because I actually Googled “family blog,” “marriage blog” and a bunch blogs popped up. But the one that was key, now my business mentor, was Lamar Tyler. He created a blog called blackandmarriedwithkids.com, a marriage blog – that should be pretty familiar with you guys. He’s been involved in some of your – and he has a site as well. And so, he was the one that – I was like, during that time, I was figuring out who to go with. You guys notice there’s a lot of choices for membership site platforms. He was the one that pushed me to you guys. And so, we got connected. He started kind of leading me along the blogging world. And then from there, the rest is history. But now, 3 years later, I’m still a pastor. But now, I’m fully able to serve my church but I’m also doing multiple six figures, multiple brands. We exploded in our growth. The membership site is one of our earmarks now for our business. So that’s a little backdrop on me. Micah: Cool. How did you pick up any of the tech? Are you technical or no? Jamal: Man, that’s what people ask all the time. Every one of our campaigns, all of our sequences, Facebook ads, I’ve done it all right. Man, I’ll be honest, I am just – I guess like, when it comes to self-education, when I know I need to learn something to get to an expected, to an end, I do what I have to do right just to learn it. The tech things for our first website, I just got a template and build it. Do you know what I’m saying? Like, I figured it out and I got enough just to keep it going. But when it got down to where we are now, man, I outsourced everything, right? But I can definitely say, we had no money. We invested zero dollars basically into our business. So barely going 3 years with no money invested, no education about this. It just really shows that it’s possible as long as you have hit a niche that is definitely profitable and you create systems to consistently turn people from fans into customers, right? So, that’s been the key thing. For me, I learned everything from Ryan Deiss, to Amy Porterfield, to Micheal Hyatt. I’m now involved in the Elite Mastermind with Ryan Levesque with the Success method. So I’ve definitely done my share of investment now into my education to be able to get where we are today. So, that’s what I can say. When it comes to the knowledge, the tech stuff, you can outsource. But all in all, like the ability just to know how it all works, has just been – we just consistently investing into myself. Micah: Nice, I love it., and I love that your business isn’t just like, “Oh, we saw this market opportunity and we went after it.” It’s so organic. It sounds like it’s cool. In that question, I was like, “Do I believe in my products? And how much do I believe in it?” And so, if I do believe in it, then I don’t need to be afraid of selling as much as I need to sell to get them to be on the other side because I know it will happen to them. So for me, man, like that concept like really got into me, and that’s why I became a master salesman [laugh]. And so, that’s what I do today. Micah: No, that’s cool. It sounds like you listen to a lot of great people. Yeah, if you go deep into that stuff and really almost if most people are just to follow any of that stuff and actually do it, mostly how it works – good stuff. Side note, I’m glad you’re in a high energy because I was up since 1 am prepping for this early morning thing, and so I’m really glad we could work with that. Jamal: It sound like you don’t need me. Micah: [Giggle] Can you do me a favor and show your screen maybe, and let’s have just a look. Maybe you can just walk us through with a high level of your site. Show us what your members see a little, and explain why you did what you did and how it worked. Jamal: So, a lot of our education framework definitely comes from Tribe with Stu Mclaren. I didn’t take his course, but I was able to get a lot because I’m in Elite Mastermind and he did a workshop for us. Because of that, I was really able to put a lot of the key concepts of what it takes, how to be a successful membership site, right? So for us, this is built – can you actually see my screen now? Jamal: So this is built for singles. And so, the thing for us was creating a roadmap, so what we call it is, The Single’s Success Path to Marriage. What are the stages that is going to take for you to go from singleness to marriage successfully? And so, what we did was, as soon as they enter in and they log-in, “Welcome back to your dashboard.” We have a welcome video here that basically walks in through what they’re entering into. If they’re going to go into FAQ’s, that’s basically all that good stuff there. But here’s our main dashboard. So what we’ve done is, our main content is broken into stages. When I click here, that would take us to the content. I’ll walk you through that in just a bit. But from this dashboard, they can do stages, they can go to the Facebook group, prayer request, member directory, which is build off BuddyPress, and then the members lounge, which that basically allows them to see all of the updates from BuddyPress and what people were posting as they’re going through these stages in the content, and we haven’t finished this one out. This one is bonuses where we’ll be taking content and taking them through some extra information. And then from there, we go down into – once a month, we do a life mastery class. So the concept there is, we don’t want you to know how to love – just know how to love. We don’t want to teach you just how to fall in love. We’re all going to teach you how to live. And so, this is an upcoming one where we’re teaching the ladies. Clearly, majority of our audience is – 70 percent are women. So this is an upcoming life mastery class where we’re bringing in – we bring an expert in some form of – something that’s more practical. This one’s going to teach them how to do hair and make-up tutorials, and this is a laugh class that will happen just for our members. But here’s what we host – have all of our previous life mastery classes. Clearly, this is all about being able to keep something fresh in your membership site for your members to be excited about each month as they’re continuing to pay their membership fees. So this right here is where we did our life mastery class on finances. We did a life mastery class on how to cook. I did one on how to master your time. So this is on top of our stages. As we continue to go, this is just 7 stages, 28 courses over a 100,000 singles helped, one spouse waiting for you. So I’m going to take you back up to our stages, our main content that our members go through. We have a 7-stage framework. And so, each stage has a very small amount of courses inside. So I’ll just take you through right – so stage 1, it’s called pursue. And for that, we lay a foundation for our members that we – on the first stage, you need to go through is your relationship with God – establishing a relationship. So each can have a fee. So stage 1 is pursue, stage 2 is past, stage 3 is purpose, stage 4 is persevere, stage 5 is prepare, stage 6 is position, and then practice. And what this is doing is basically taking them from our recommended process of you being able to go from completely single to us now helping you find someone, and then also helping you date and then successfully get married. And so, when our members do come in, they do begin at stage 1. Each stage has, I think, right around – some have like 6 or 7 courses inside, and when I say courses, our courses are no more than – each one, like each – so you’re seeing here that’s an hour, and then that’s an hour. Before I go into that, is there anything that you want to ask in that part right there? Micah: When you say that each stage has multiple courses, do you mean LearnDash courses? Like multiple LearnDash courses per stage? Jamal: Yes, LearnDash courses. We do – we use LearnDash, as you can see, for our – to hold our courses. Each stage, has multiple courses that they have to go through in a synchronized order in order to be able to go on to the next stage. Micah: Got you. Yeah, go ahead and keep going. Jamal: Yeah, so this is stage 1. This probably is our lightest stage because we want them to get a quick win [laugh]. We don’t want to overwhelm them in stage 1 where they’re feeling like, “Wow, this is going to be –“, you know. But once they got into stage 2, it can get pretty – it gets really in-depth. It’s about – I’ll show you how many we have to – we have…Let’s see how many we have in here…1, 2, 3, 4, courses inside of stage 2. Once you go into the, you know, you select the course and then it takes you into the videos. Each video has an intro and its own respective lessons, and then the outro. All of the videos were shot right where I’m at right now – in my basement studio. We had different instructors come, and different ones that I locally know. It’s a common teach, so I didn’t do all of the courses myself. We did have guest instructors. Even for this one, this is a guess instructor here. I can show you the video . But this shows you an example of our video for the intro [playing video]. So I just gave you a quick example of our guest instructor, someone that we brought in that we made – that was an expert in that topic and be able to use them for – and then, here are the comments. We do a lot of the “Leave comments” as they go through the content and engage with one another. We do ask in each video that our instructors give them, called caught actions – [hand] in the bottom, post here. And this kind of really just builds even more proof because, honestly, I think a lot of our members would go in and they see a lot of comments. And so, we really market strong that one new membership is paying that one year fee. So go ahead and lock yourself in a year so you can be able to give yourself time, versus being rushed to go through the content each month. Micah: No, I love it, and there was a lot of little nuggets there that you’re dropping all over the place that I hope people are picking up on. A couple of follow-up questions for you. One question is, throughout this process, do you do any sort of quizzing? Like, most people use LearnDash to use that, but I didn’t see it. Do you do any of that, or was it not necessary? Jamal: Definitely something for our next stage – our level – taking this to the next level is really using the quiz function, but also even submitting papers, whether it’d be a quiz or submitting a paper, but we definitely want to find – get our members having to follow-up with that form of commitment into the information that they receiving – making sure that they’re getting it and not just listening and hearing it. And so, that is something that we definitely want to implement, but we haven’t done it yet. Micah: No, it’s perfect. A lot of people actually get hang up on that. They’ll make their content and they’ll think, “Oh, I need quizzes and stuff.” So, I’m actually glad that you said that like, not having quizzes is not a problem, especially since you have a working site and people are going in there, right? Jamal: We got it, yeah. No, I was going to share, you know. We’ve kind of been on this for, now, what? Almost 5 or 6 minutes and we haven’t shared the thing that makes – I think, that makes so much more authority to this – is that we were able to get 834 members in two weeks. We closed enrollment within 800, and then we get a January open enrollment. Now, we’re over 1,100 members inside. And we only had – I think it was right around. I think it was right around the time we went from the November launch to January. We only had lost 62 members which is pretty amazing kind of from what I’ve learned and what I’ve heard from other membership sites. I won’t say that it’s our content. It’s definitely our community. So that right there, I can tell you straightforward is, people come for the constant engagement. You sell them all – the journey and the process. You got to take them on. But they definitely stay for the community. If you know how to create a community that supports each other, that is walking with one another through this journey and that gets each other, you will get people. Like someone in our community said – I remember we’re doing this for singles – they said, “ I will stay in this community even after I’m married.” [Laugh] So that’s the kind of community that we’ve created. And I can tell you now, Micah, that was not something that was part of the plan. I knew that it was something we needed, and that was essential, but I didn’t think that it would be such a win for our membership site to the degree that we’ve already done a major upsell to membership groups – mentorship groups – where we’re charging 500 dollars every 3 months if you want to be able to be part of a small group mentorship to be led by one of our community managers. You can really be able to get that support of help because we hear them in Facebook community where about a thousand people – it can be a bit challenging to feel like you’re getting that personal help. Hey, for 500 dollars in 3 months, you can get into a personal group. Because this community is so down to each other and they love it, we just built it. We have two groups that just launched. I think we’re already over 20 people that’s paid to get that upsell and go into those mentorship groups. So that shows you how powerful membership sites are because, now, you have your own – we have our own breeding ground of upsell customers and we can take them deeper and take them into our world. So yeah, that’s a whole another – known other teaching [laugh]. Micah: No, it’s beautiful. I love it. You can probably just roll this whole time and it would be valuable. So really, genuinely, I love it. I was going to actually touch back on – yeah, the fact that, yeah, you have those comments running under the video and you’re kind of saying that social proof/belongings/anticipation of good content was a big key, right? Jamal: Absolutely. It’s one of those where, if they know that others have already enjoyed it and being changed by it – because I know for me. When I go and I’m reading these comments, as a consumer, it’s – I know for me, when I did blogging, it was just like – man, the first thing I did sometimes is read and see how many comments are on there. So you see that each one like, “Darn up, this is so deep. Wow, I’ve never heard this broken down like this. It’s so detailed. Thank you.” If that’s the first comment you’re seeing, you’re like, “Oh my goodness.” Like, “I can’t wait to dial into this.” That person, especially if he’s the one saying, “I’ve never heard something done and said it like that.” So it brings some foundation and content, but it also continues to build anticipation for the other – and this is on all our videos. This is not just – this one, this is on all. And so, it’s pretty awesome. Micah: Yeah, I know. I believe you said – and I just want to make sure everybody caught this – you tell your instructors to make that caught action in every videos. So those comments are not accidentally, right? You’re soliciting those? Jamal: They’re intentional. So as a caught action, we don’t want them to feel apart, “Hey, post at the bottom what you – comment at the bottom what you got from this.” And if they’re not doing it, they’re – I’ll be honest – the membership lounge is the only thing that we’re kind of seeing that, is this working for us? Is it not? Only because our Facebook community is so electric, so I haven’t even checked. But the fact that Autumn posted it 3 hours ago and this is 19 hours ago, it’s still showing that people are still posting in here. But honestly, our Facebook community is where everyone hangs out. But clearly, there’s still a lot of life going on behind the scenes. Do you know what I’m saying? And not in Facebook. And I know a lot of membership sites that struggle to get people commenting on their – inside the platform. Do you know? Jamal: And so, that’s the whole thing. I don’t even check this. It’s my first time seeing this in months [laughs]. Micah: No, got you. Well, and so, before it, we talked about this. I do want to also want to reach back and address right at the beginning when you were talking about, not the origin of the story of your product, which is really cool because it’s original, but you have a really – it seems to me like very pure and genuine intention for your users. So that’s one of the things people overlook quite a bit is, yeah, you can have all of the gimmicks you want. You can ask for all the comments all you want. But it start with having a really good intention for your clients so that your content comes out so that they want to comment, right? And that’s what I’m seeing here is just like, yeah, this whole thing seems on point. So let me ask you this, what was one of the more challenging parts of building this for you? Jamal: Challenging? Man, that’s a great question. I’ll be honest with you. I think you said, because we get something that was such a need in our niche, it just flowed right out. We care about our audience. I was my audience at one time. My wife was my audience. All of our community instructors were, or still are, our audience. And so, we get it and we get the struggle of desiring something that you don’t have, but then also the fear of getting it and not being ready for it – the whole world of it. And so, when you understand your audience, it really does help you to have a better membership community because that’s what it is. It’s a journey and you’re taking your customer on a journey with you. And so, that’s – and I can tell you, for me, one of the most challenging things is just the end of – man, I’ll be honest. It’s the client cards [laugh] – cards declining and knowing how do we work this with that process of getting them back, or cancelling them because they didn’t pay, their card failed – that’s one of the big challenges we’re running into now. With over 1,000 members, we’re looking at a 4 to 5 thousand dollar gap between what we should be getting and what we are actually giving because of the client cards. This is not cancellations where people simply not having the phones in their account. And so, that’s a big one, a big challenge. Another one would definitely be just the creating sequences that can continue to take the bottom of our audience continuing to go through it. Clearly, with over 1,000 people, you’re going to have the bottom of it. They’re not doubting. They are not connected, but you’re still taking their money. I don’t want your money if you’re not getting changed. So it’s creating sequences that could continue to take them through and remind them, “Hey, you did not – we haven’t seen you log-in in a month, two months. What’s going on? We want to see you jump back in, log-in. Hey, get this content. It’s going to change your life.” So for me, I know I need that, but it’s getting the time to create those sequences and layout a 12-month plan that can be automated so people can get a reminder email once a month, or should go into a person’s [dying] side. I think it’s knowing that something we had the capacity to something they’re not being able to do it, or not knowing how to do it, or not having the time to do it. It can be a bit challenging. Micah: Yes, sorry I didn’t realize my seat was squeaking like that. Micah: Yeah, it’s a cool problem to have like the billing problem. It’s annoying as it’ll get, but it’s like, “Okay, we have subscriptions. We should be grateful. But, dude, that billing is a mess. And, yeah, those sequences you get people re-engaged.” I remember with the membership site I made. I had an opportunity later, like a live setting, to ask them how that worked for them. Most of them told me, “Yeah, it would never got through your content if it weren’t for all those emails”, like bringing me back kind of a thing. It’s funny because – at the same time, there’s so many best practices that I’m not doing. Do you know what I mean [chuckle]? So I know how you feel. It’s like, “Yeah, we got to do it more.” So, it sounds like you follow a lot of cool people and it sounds like you know a lot of the back stuff. Is there anything on your site that you would say is pretty unique, or like the most unique thing about your site? Jamal: That’s a great question. I think the thing that would be pretty unique, possibly it would be – possibly our Facebook community and what we do in there. And so, we have like a – every week, there’s a thing happening in our Facebook community in our online membership site, so once a week. On the first week of the month, we do an evening prayer night where all of our community come together. We take prayer request and I call them out, get on, and that’s pulling on the pastor in me being able to really put these people on a spiritual journey, as well as the relationship journey. So once a week, we do prayer night. On the second week, we do accountability night where we have everyone come to share and be accountable with where they are and just get on, which is like, “Man, this is where I’m at. This is where I’m at. This is where I’m at. This is where I’m at.” And then, the third week is a bi week. We can be able just do something random that week in the Facebook communities – just the rocks finale, or whatever we’re feeling. Then the fourth week is live mastery class. I haven’t really seen that having a theme – something that our community can look forward to every week and be as consistent, and it’s not just spontaneous. And so, that’s pretty cool. Most of the time for that bi week, we usually do like a spontaneous Q and A on a particular topic. So the one thing I can say is, having something every week that your community can be excited about and to always be able to push them back into your content, into the membership site. It’s so essential and so key. I know, for most people, they go to membership sites and they want it to be DRIP and automatic, and they leave it alone, and it’s just like, “No.” For us, man, what keeps us living and what keeps this thing alive is the members know – when they get in, they’re not just only getting a bunch of content, but they’re getting me and my wife, and our team, that’s very down in. The only thing that we do once every Monday morning is we send out the word for the week. It’s our weekly newsletter. But in it, we have a word of the week. It’s something for them to embody, to take with them throughout the week to ponder and chew on – and that’s what we have in that newsletter. We do a word for the week, and as well, we do talk members. You know where you can get that stats from – from Grytics, or Sociograph. So those give us some stats of who are the best engaged people. We celebrate them, “Hey, this is – Jasmine, this week, man, you commented on over 40 people statuses inside the community. Thank you so much. We celebrate you for being a party engaged.” “Hey, Amber, it was amazing. You shared a post that over 103 people liked. You are the most influential woman this week. Thank you so much for your commitment to the community.” Because we put those pictures in the newsletter. And then, we go down and we also have the top post for the week, and we were able to share to everyone. These are the posts you don’t want to miss. Do you know what I’m saying? So these are the things we’re doing out of consistent basis to continue to keep our members engaged and excited about what’s happening here. Micah: You know, that’s so smart because some people – they spend a lot of energy doing parts of what you’re doing – meaning, “I’m going to put out content every week”, or, “I’m going to touch base”, or, “I’m going to do these things.” But I love the fact that you put a theme around it because it keeps it fresh and different. It lets them know that you’re thinking about them. And then, it helps them like focus together as a group. A lot of the group – and I’m sure one of us from Tribe, or what not – but yeah, your implementation of it – the term that keeps coming to mind is just spot on. It’s so funny to hear you say this just like, “Wow.” And for people listening – like I’ve had to stop a while anyways. It just tickles my brain talking to you that, this is why – this is the difference between successful memberships and those that are non-successful. It’s not just like that’s it a good content. It’s that you’re into it enough to that maintenance work that builds an actual business and an asset, and Tribe, and all of those things. So, it’s cool to hear. I’m just digging your excitement. So one thing we’re doing right now, we’re going to have a close enrollment. And so, the challenge is figuring out, do we want to have this open enrollment and just have a funnel, like consistently push people in? Or do we want to continue to have that private feel of, “Hey, you better get in now, or it’s going to close down and you’re not going to be able to get in until the next time we open, which could be in 3 to 4 months. And by that time, you could have missed out on a whole lot of –“ , you know. So that’s kind of like a big challenge we have. But, man, no matter what, for us – 5,000 people, 2,000 people – the fact that we’re doing six figures on our membership site alone is just exciting to me and a success to me. Micah: Oh yeah, definitely. It sounds like you’re helping a lot of people, too. If they’re interacting in Facebook like that and commenting on the videos, yeah, they like it which is really cool. So you do feel great about that. It’s like you said, you don’t have to feel bad about selling when of the product’s right. So let me ask you a little bit about your sales funnel. So tell me – because we started with the site like they’re in it. You mentioned the ASK method. Just kind of briefly walk us through your best strategy for getting members. Jamal: Clearly, man, the one thing I said earlier was me being able to use webinars as a huge track. So we did a webinar with the influencer this past January right when we’re still – first, so we did it around second or third week of January – we had our open enrollment. And honestly, I did not have a lot moving into the open enrollment. We didn’t do a big launch. It was simply data waiting list. So if I can show you, I’ll go to our – the landing page for it. So this right here on the bottom page – not the wait – the landing page. So they go to marriedandyoung.com. Right now, they get on the waiting list, “Don’t miss our next sessions. It’s hard to be on the waiting list because we have free training.” So our funnel right now is getting people on the waiting list. But as well, whenever we do open enrollment, we have webinars. We use a huge enrollment for the One University. Then we also have a quiz that we created using the ASK method that basically pumps thousands of leads preparing them, and then we nurture them because they’re low quality leads coming into that quiz and we nurture them for about a good few weeks, or about a month or so, with some very highly engaging content. We’ll really prove to them that we can help them on their journey of singleness into marriage. And then from there, we pushed them into the webinar. We engage – we bring them to the quiz. We engage them with emails. Then we get ready for our big webinar, and that’s when we push them to the webinar. On our webinar, we sell them the membership on the [one] university. So that’s kind of one of our major funnels that’s very successful. Like I said, this past one that we did – between the waiting list, Facebook ads, and just the quiz funnel – we have over 5,000 people sign-up for the webinar. We had 2,400 on live. And we ended up converting right around 8 percent which as membership sites is a bit challenging – a lot of a new audience. But what we did was, we only sold a year membership and we didn’t give an option for monthly because we really want to push people to commit to it. So we pushed 147 one year, and we ended up doing 26k for one year memberships. But then, on the back end for those who did not take the one year membership on the webinar live, we did put them on the sequence to get the monthly. Basically just saying, “Hey, we saw you didn’t commit for a year. Guess what? I went ahead and made some changes and we’re going to get you in the monthly. Now, here’s our monthly cost. You can now go in there, no risk, and you can be able to –“, and the reason I’m doing this is because we’re seeing so many people paying – choose the monthly, but they’re not able to feel that commitment because their cards are declining. So our thing is, if we can get you to pay for 6 months or a year, man, that’s gain and it’s a better for our community because you’re more committed for an entire year, versus, “I’m not sure if I want to stay in this for 2 more months, or 3 more months”, or whatever. So that’s kind of our – that was like our gain for the webinar and for the funnel. Micah: Yeah, that makes sense. I was going to ask you to kind of explain a little bit more of that, but you did. And so, I really appreciate that because I think a lot of people listening, they see this success and they hear about this success but they’re just like, “Okay, so what did you do?” Do you know what I mean? But that’s pretty concrete. What you said is pretty concrete, so I appreciate that. So let’s jump ahead a little bit. What would you – let’s say you’re starting a membership site over knowing what you know now. What would you do differently? Jamal: Well, a great question, Michael, because I’m getting ready to do another one. I will be actually taking the same framework and using it for my entrepreneurship over the new business that I’m launching. And so, basically there will be 7 stages to a six figure online business. And so, for me, I’ve been already processing, “Okay, as I get ready to do this, what would I do different?” Number one, change our name and I definitely would not try to do all of the content before I launch. I would definitely go ahead and just do maybe half of it first, and definitely DRIP. A definite DRIP really makes people have to wait. They can’t consume it all at one time. They can’t just go get it as they’re finishing it. But they have to where according to a specific timeline in order to make sure that they’re remaining anticipate – the anticipation is high. So I definitely would not have to stress out about having all of the content done. I definitely would call through DRIP in order for them to go through them on a specific timeline that they’re getting to a platform. And then, as well number three, man, it has been, for me…I don’t know if I have anything else that’s on my mind that I would do different. We do so many things so well. I know I will be able to duplicate in our new platform with the entrepreneurs. I’m excited because I have something that’s living and breathing to show them that we’ve been able to do and create. So I know it’s just going to be as electric community as my relationship niche. Micah: Yeah, and I mean, Andrew is saying a little bit before the call like, “Yeah, we’ve seen a lot of people do that kind of thing and just take off with it.” So I’m sure you’re going to kill it. So that makes sense as far as basically – you do less of the content, earlier. Is that just because it’s less work? Or do you feel like you’re going to learn something to create the second half of the content? Like what’s the thought process behind those two changes? Jamal: Definitely less work so you can be able to get it out to the market quicker. We took 3 months to film the content. I can only imagine if we would have just take in a month to get the first bit done and release it, and then built it out as we went. I would have made us an extra 450,000 dollars. Do you know what I’m saying? That would have been a great way versus us waiting. So we already have a nurtured content and a nurtured audience. So I think less work, but there’s no strategy behind just like – because the content that we have in there is great and it’s solid. But I just wondered who would have spent more time on a marketing, and then building up leads, or something like that, versus all of the time we spent doing over content. But it’s great because all of the content is done, so we don’t have to worry about that. It’s a win-win – that would do. Micah: Yeah, it kind of cuts both ways because I’ve done it both ways, too. It’s kind of nice to have the content ready when you do the launch because, then you could have just managed sales and you’re not doing double duty like making content for the lead members and all of that kind of stuff. Yeah, it can be stressful. But I also understand, yeah, I sell them in a viable product and see what happens from there. So what advice would you give to people? So generally looking at this who’s either running or thinking about starting a membership site. What advice would you give them? Jamal: Absolutely. I definitely say, if you’re considering it, it is one of the greatest tools to being able to build a sustainable business. I am so grateful for the membership sites because, not only has it changed our life, and personally being able to now break the six-figure barrier in our business and now going into possibly grossing over a million this year, and this being a sustainable revenue. So I now have the capital sort of fund to all of my other projects because I know I have this money coming every month. So I definitely encourage you to jump in and do it. But this is what I would say before you do it, make sure you have some partner – someone that you can trust that could help you to build it out right and do it with a fine work that’s trusted. Make sure you have an aim, goal, and mind for your audience that you know where you’re trying to take them so that you can sell them on where you’re going to take them and not just simply all of the other features of your membership site, “Oh, I’m going to have 40 videos. It going to be – we’re going to have this every week, this every week, this every week.” They really don’t care about that. They really simply care about where you’re taking them and can you successfully do it. What is that roadmap look like? And once they get in, all of the bells and whistles is going to be icing on the cake for you and your audience, and they will stay a lot longer because you over delivered. We didn’t sell people on our month and weekly things. We sold them on the journey, and then all of the other stuff is just an icing on the cake. If you’re considering starting, I’ll definitely say, put a lot of energy into nurturing your audience now – don’t wait – nurture, nurture, nurture. So whenever they position to go deep with you, they need to care about you as a – whether you’re a founder, or whether you’re a blogger, or whether you’re a business owner – whatever you are – then they care about you. So make sure you nurture them and you involve them I your journey. And now, make sure you’re selling them which is so much easier because you can say, “Hey, I’m going to be a part of this. I’m in this, right?” They’ll be like, “Wow, since you’re there, this is the way for me to get closer to you.” It’s cool, right? That’s the key thing that we did for ours. If you’re in a niche, that supports that. But if you’re the one that’s managing it – let’s say you don’t have as many people in the site as you would like for it to – like to be in the site – my encouragement to you, for you managers that was just having and trying to get more people, man, is to really get down into how well do you know what you’re – who your membership site is for. So my thing to you, you need to really go in – survey and really get to know your current members, and find out why they’re in, what’s winning them – won them over to get in the site. And then you go after and find those people that are looking for that, and use the same language to be able to persuade people to get in. And so, that right there is the key factor because you may not have the formula yet, so knowing exactly what people are looking for. But there’s some people – if you got at least 20 people in the site, you did something right for those 20. So take those 20 and go find out how you can go find a hundreds more that are like that 20. So that’s my encouragement to you managers. Man, I’ll just say continue to put in. Don’t think that it’s not for you because I could guarantee you this is a people business and every business that I know were involved to people. And so, this is why it could work for you. Micah: Dude, that was perfect. Say your advice for somebody who’s not been doing this too long? Obviously, you’re very successful – so that shows. Jamal, you’ve been really generous with your time and your energy, and showing us stuff, and your information. Why don’t you just take a second and tell people – if you have anything that you want to tell everybody about, either for the marriage business where it sounds like you might be able to help them with their membership sites? What do you got going on? How can they connect with you? What can we do for you? Jamal: Sure. Man, I am in the point in my business where I’m worrying that I have a responsibility for other entrepreneurs. And so, if you’re an entrepreneur out there and you relate to my journey, whether being me having a – born from [chuckle] – pastoring, ministry – to now where I’m at today and get where I’m at, and you relate to my journey and my story, I definitely invite you to continue to get to know me. You can find me on Facebook, Jamal Miller. You can just follow me there. But as well, I do have a – like through out there – an opt in. You can be able to get into my entrepreneurship list. In the next few months, I’ll be getting ready to launch a membership site for entrepreneurs teaching them all of the different tools and streams of business we’ve created from our webinars that we can do – thousands of dollars only on one night, through membership site, through our programs, through our conferences. We do online conferences, virtual summits to every year. This year, we’re projecting over 600,000 dollars just from our virtual summits alone. So there, I’m pretty well versed in some different forms of business. But whether you are from virtual summits, to webinars, to membership site, to something that’s building a successful blog, I can help, man. But I will say this – this is one of those things where I don’t have anything formally created yet. But what you can do is, you can go to – if you want to connect with me and dial in to me, actually I’ll be doing a free webinar next week on Webinar – how to do webinars? Webinar has been such a key tool. I’ll be going into the anatomy of 6 figure webinar – alright, the anatomy of a 6-figure webinar. I’ll be breaking down how I use the same framework for every one of our webinars. We used one presentation, one powerpoint – but that’s not it, there’s another one – every week for 1 year. That’s how we built our email list. Over 50,000 people in one year, we used the same webinar every week and we were able to build our business to where it is today. So that’s something that I can tell you I am very knowledgeable in. But if you want to dial in to me, this is the link you can go to: tiny.cc/6figuretools. What I’m going to give you for free is the tools we use to run our 6-figure business. What do we use for webinars? What do we use for email marketing? What do we use for the landing page? What are the tools we use to be able to run our business? It’s right here will give you the opportunity to now get into the my world because I will see you as serious, and then I’ll take you into the next arm of our business – being able to risk walking with you through this process. So get on that list and that right there will show me that you’re ready to take things to the next level – whether you are a business owner that’s trying to get 6 figures, or you’re trying to go from 6, 7, 8 using membership sites to be that next level for your business. Let’s do it. Micah: Beautiful. And everybody listening, I am confident that you can feel Jamal’s energy and his excitement, and all of that. And so, definitely connect with him. We’re going to put some stuff under the video so that you can find his links and figure out how to connect with him on Facebook. But yeah, if you like what you’ve heard and you want to learn more about that, connect with him because it sounds like he’s going to teach membership sites webinars – all of these different things – and help you achieve the success he’s achieved. So, Jamal, I just want to thank you again for your time and your generosity in sharing. I’m sure we’ll be on another call like this again soon. Jamal: Absolutely. Thanks, Micah. I appreciate you and all that you’ve been able to contribute to membership site, where all of the Memberium is just – I appreciate it, man, and it’s amazing. So everything connects, and then being able to serve us Infusionsoft folks. It made it easier for us to run our businesses. So, thank you. Micah: And thank you. See you, guys.